Place the onions, cilantro, parsley, lemon juice, olive oil, salt, pepper, jalapeño, honey and garlic in a food processor. This way your chimichurri is ready when you are. Add the vegetable oil to a pot and heat to 350°F Once the oil it hot, fry the plantains for 3 minutes or until they've lightly browned. Once they've fried, place them on a paper towel to absorb the excess oil and let cool. Once the plantains are cool, use a cup to flatten them. Use the bottom of the cup. Place the tostones back in the oil for 2-3 more minutes or until they've browned. They're now ready to served with chimichurri and queso fresco. Use paper towels to absorb the excess oil from the tostones. 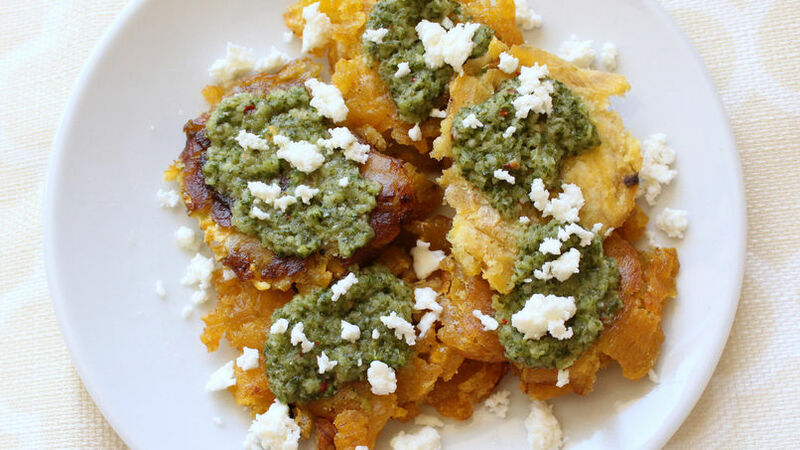 Tostones are a typical dish in many Latin American countries, especially in the Caribbean. They're made with green plantain. The preparation is easy and the result is delicious. Tostones can be served with many different things, depending on what you like. For example, with chimichurri and queso fresco. I love this combination of ingredients because it highlights the taste of the tostones. I hope you like it.